What: If you didn’t know Asian–Caribbean street food was missing from your diet, consider yourself informed. After a stint at the Michelin–starred Fat Duck, chef Craig Wong pulled from his mixed heritage—Jamaican and Chinese—for his new restaurant. 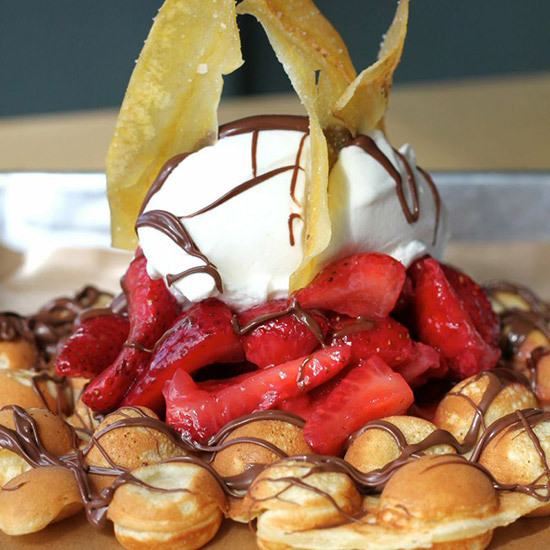 If you’re looking for something on the menu to soak up all the bad stuff from the night before, we suggest the Hong “King” Kong Waffle. Based on Hong Kong street waffles, which instead of having pockets like traditional European waffles, look more like delicious egg crates. Wong makes his batter with potato starch, custard powder and evaporated milk to create a more savory option. He pairs that with a sweet topping of Nutella, strawberries, whipped cream and plantain chips for a perfect combination. Wash It Down With: The Piña Calypso is a perfect blend of Wong’s influences. Made from coconut rum, coconut oolong tea, Cherry Heering––an intense cherry liqueur produced in Denmark since 1818—and pineapple shrub. Even though you’re in Canada, you’ll feel like you’re beachside. Bonus Tip: Because chef Wong always hated the thought of missing out on something he didn’t order, at dinner you can ask for The Whole Shebang, a ridiculous offer that for $100 gets you every single item on the menu. They say it serves three to four people, but we say sharing is for children.